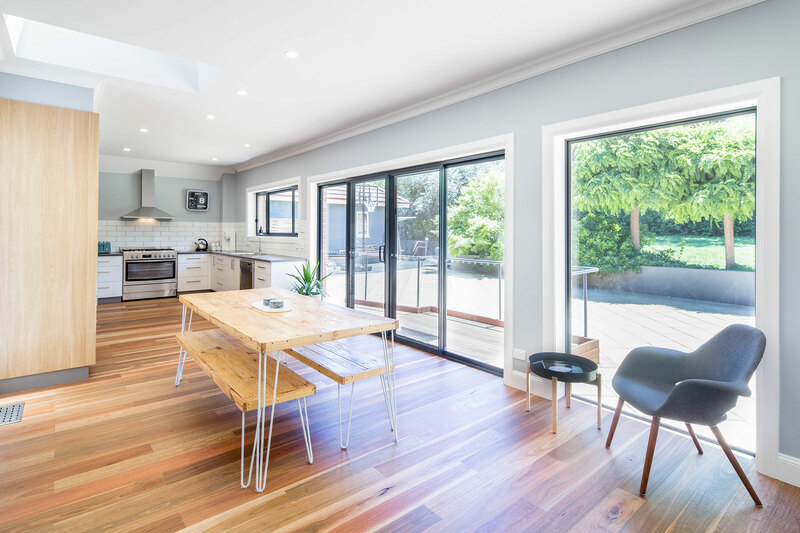 Build Professional has transformed our lifestyle, bringing by design more functional space and natural light to our old home. We are delighted with the results and enjoyed the care and energy brought to the design and build by the Build Professional team. We were drawn by the benefits of engaging a company that delivered both design and construction. 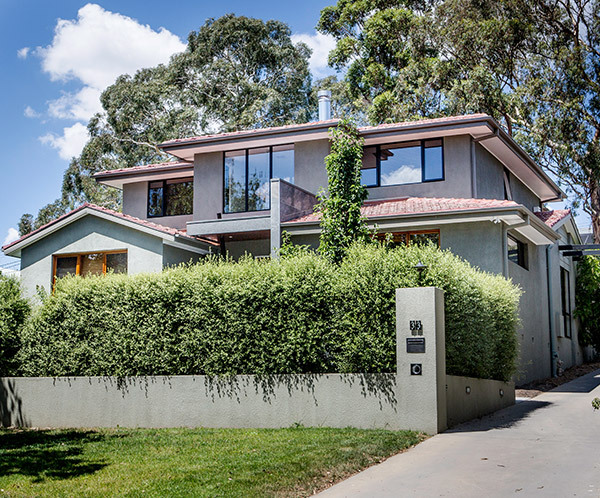 Our challenge was to improve the functionality and efficiency of our home for our family of five, including adding a second story and double garage, whilst phasing the renovation to allow us to remain living in situ during the build. With due consideration for our needs and through resourcefulness by the whole Build Professional team, the journey was efficient and effective, delivering a design that met our needs – sympathetic to the surrounding street scape, maximising space and the northerly aspect, yet with a more modern feel. We were so appreciative of the Designer and Matt Hall’s patience and advice as we worked together to develop the design best for us and our budget. 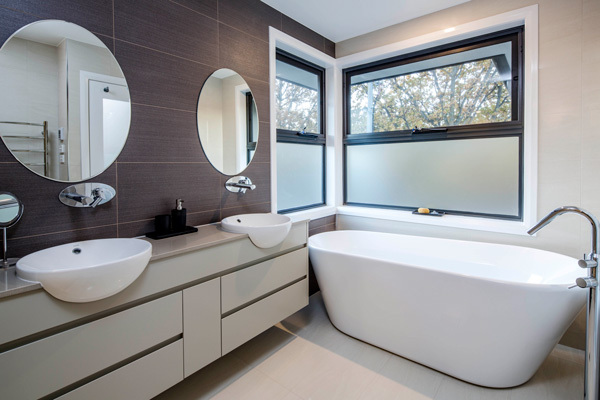 The Build Professional team set us up smoothly to commence the build and took the hassle and risk out of searching for builders against a design and gaining local approvals. Our Project Manager, Wayne, and his subbies were cheerful, skilled and reliable, on site early and putting in a full day’s work, and often weekends throughout the build to keep on top of schedule. 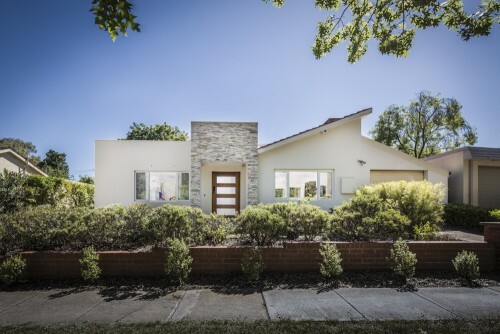 A very pleasant and competent Build Professional team kept us informed of progress and drew to our attention early any emergent issues or potential cost drivers invariably associated with renovating an old home. Matt Hall and his team were courteous and did everything they could to make our lives comfortable during the build. We are so happy with our choice of Build Professional and would happily recommend them to others. Thanks again Matt, Wayne and the team. We needed help! Our place was quaint and charming but completely lacked functionality. With two growing boys (one requiring accessibility modifications) we needed to create more space without extending. From our first interaction with Build Professional it was evident that they ticked all the boxes. Professional, robust processes and procedures, open communication and, design conscious without sacrificing function. Design and build was the perfect option for us, as we wanted someone else to take charge from beginning to end. The design process was a complete breeze. The team listened to what we wanted and although we had a really good idea of how the space could look the design that they came up with was so much more beautiful and functional than we had imagined. It was also within budget. We had lived through a number of renovations before so we were prepared and at no time were we left without the essentials for living such as hot water or electricity. We really appreciated that the construction phase was so well orchestrated. Everything was so well organised with all the trades coordinated so that the build time was as speedy as possible. Build Professional went above and beyond on two occasions during the build process. The first when they noticed water damage in our bathroom that had been renovated 3 years prior. The team contacted the builder responsible and ensured that they rectified the damage in a timely manner. The second occasion was when our heating system failed. The team were on it straight away, recommending a supplier that was competitive and could get a new system in very quickly. We are so thrilled with the final result. We have a light filled kitchen dining space that leads onto our beautiful garden. The renovation has made our lives so much easier – especially in relation to accessibility for our youngest son. Thank you so much and we’ll definitely be in touch for phase 2. We found the design process productive and efficient. The designer quickly identified our needs and presented us with a variety of options which reflected these. We also liked the fact that he was very open to our suggestions. Prior to the commencement of the build we were given a good understanding of the different stages of the project and what to expect in each of these stages. Build Professional were happy to answer our questions and address our concerns. We lived in the house for the entirety of the renovation and they worked hard to minimise disruptions to our day to day life. Despite the build taking longer than we originally expected, the quality of the build and attention to detail exceeded our expectations. We are very happy to be living in the finished product! We want to thank Matt and his team for the wonderful work they did to meet our design brief. Not only did we want more living area taking advantage of the northerly aspect of the block, but also extensive changes to all but one of the remaining rooms in the existing house. It is a testament to the experience and professionalism of the design team, that the delivered concept required little tweaking to arrive at the final plan. No build is, I’m sure, without risks and issues, and we had our share materialise. However, Matt’s office team, principally the Production team, worked with Sue and I to ensure these issues were raised and resolved sympathetically and in a timely manner. We lived in the house throughout the renovation, except when the work being undertaken made it impractical. Build Professional went the extra yards on one of these occasions to accommodate us, unexpectedly, for three nights at East Hotel, and was greatly appreciated by Sue and I. On site, the Project Manager, an affable, cheerful young man, even at 0730 on a cold, dull late autumn morning, his attitude to work and communication skills were excellent. We knew what work was being undertaken on a weekly basis, and were able to track that with him each day. The Project Manager’s efforts were commendable and very much appreciated by us and we particularly wish him all the best for his future. 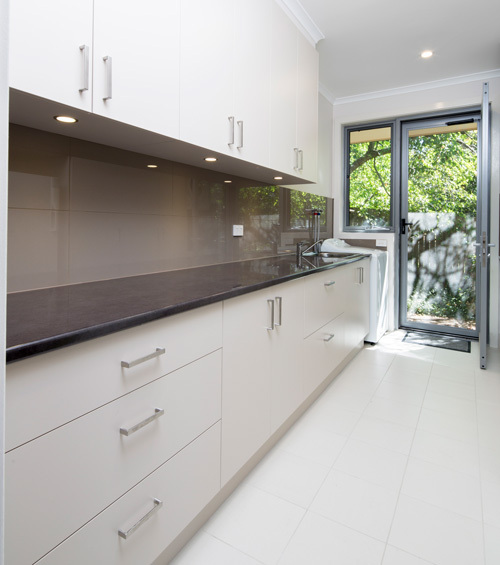 We extend our thanks also to P&K Joinery for the beautiful kitchen and utility room joinery. The Kitchen in particular is the standout feature in our new home. We would also like to acknowledge the efforts and attitudes of the many other subcontractors who were involved. Matt has put together a great team of tradespeople under the Build Professional banner. Thank you Matt and your extended Build Professional team for our new home. They’re called Build Professional. The name says it all. From our very first contact we felt we were dealing with the right people. This feeling continued throughout the various stages of planning and construction and now, here we are at the other end of the journey living in the house of our dreams. We just couldn’t be happier. Professionalism was evident throughout. From the initial design phase through to the actual construction, we were treated with such courtesy and respect by all of the teams involved. More interestingly, even when they didn’t know they were being overheard, this same respect was evident within the teams themselves. Indeed this was a very cohesive group of tradespeople. This only enhanced the feeling that we were in safe and competent hands. How many people undertaking a home renovation could say that of their building team? Invariably it’s more likely they’ll relate a horror story or even the wish that they’d never even embarked on such a venture. Our project involved not only the renovation of our existing home, but also the addition of an additional story. This was a considerable undertaking which was further complicated by our desire to remain on-site for the duration of the build. Our Project Manager did a sterling job in organising the work and various teams in such a way that our level of inconvenience was minimal. We are so grateful to the team for the competent way they achieved this. We’d steeled ourselves for such an arduous journey and were bracing ourselves for when the going got rough. The amazing thing was: it didn’t! So now our home is complete. When we wake up each morning we can barely believe we are the lucky people who live in this wonderful home that so fulfils our dreams. But we also feel so lucky that we chose to go with Build Professional. They had the vision and the competence to make our dream a reality. To simplify the whole renovation/extension process, we were looking for a company that would take on the whole project from start to finish. From design to building, Build Professional did just that. They designed and extended our three bedroom home and delivered an extra two bedrooms, rumpus and bathroom that fit our brief and budget. The designer being able to work closely with the builder from the beginning I felt helped to deliver a layout that closely met our needs and budget and minimised any surprise costs. From start to finish Build Professional were an absolute pleasure to deal with. The entire team at Build Professional know exactly what they are doing. This made the whole process so much easier for us and now we have a beautiful home that we can enjoy and be proud of. Professional by name, professional by nature. The team at Build Professional were just the loveliest people to work with. Anything we requested or enquired about was happily fulfilled. Nothing was too much trouble. When extending our home to cater for our growing family, we wanted a company that would take us right from the planning and design stage through to the final coat of paint. The team at Build Professional were the perfect fit. 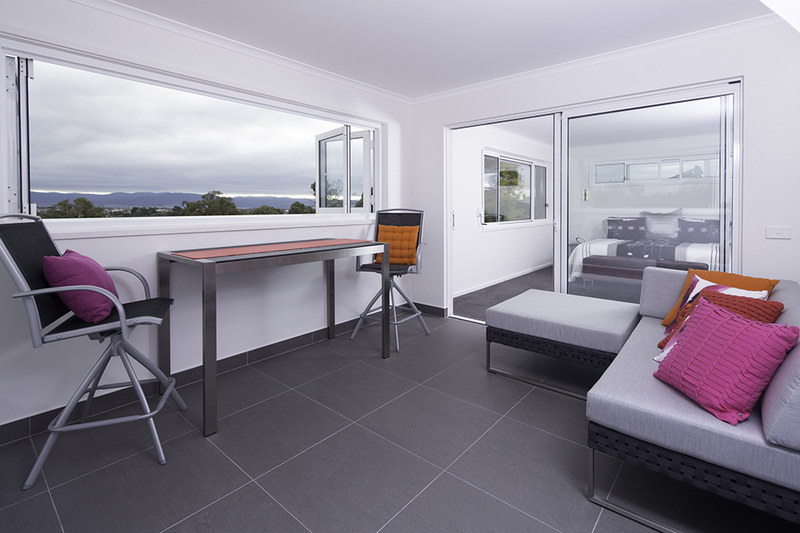 They helped us convert our former lounge room into an additional bedroom and created a wonderful new lounge room by adding an upper storey – capturing the sunlight and beautiful views to north Canberra. We are very happy with our new extension and it was a pleasure working together with Build Professional to achieve it. Right from our first meeting through to build completion we were impressed with Build Professional’s professionalism, communication and enthusiasm. 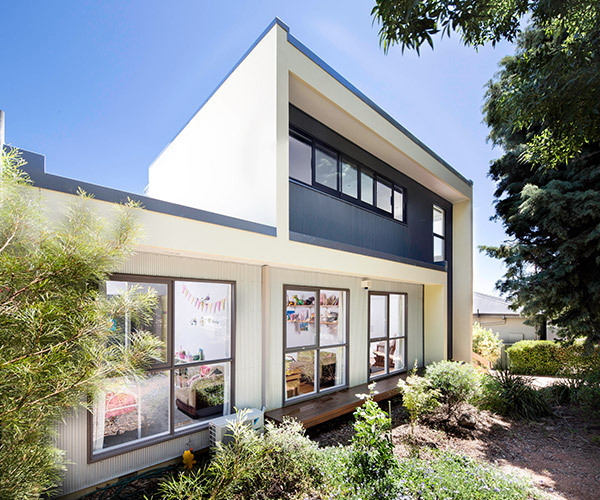 They have delivered an extension and renovation that has transformed an ageing, tired building containing two tight units into a modern, open and fresh family home. Build Professional’s ability to take us from design concept through to a finished build made the process smooth and straightforward. It was clear that Build Professional took great pride in delivering high quality work and in ensuring our satisfaction with the project. Build Professional took on board what we valued and wanted from our home and captured this in their design. 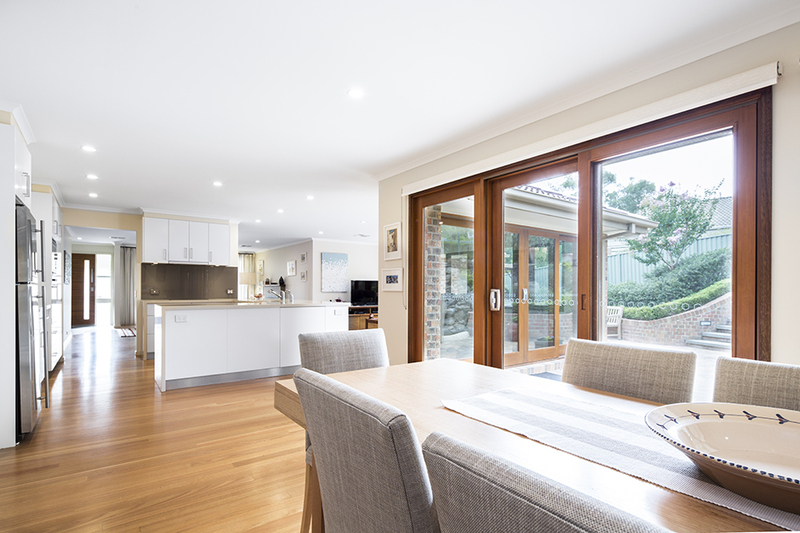 They made great use of the site for our extension – maximizing our space, aspect and light – and helped us overhaul the original residence to a contemporary layout and look. Critically, Build Professional remained conscious of our budget throughout the design and build. The team’s communication with us was excellent. Each stage of the process was clearly explained, and we were kept up-to-date with what was occurring. Options or issues that arose were quickly communicated and addressed. 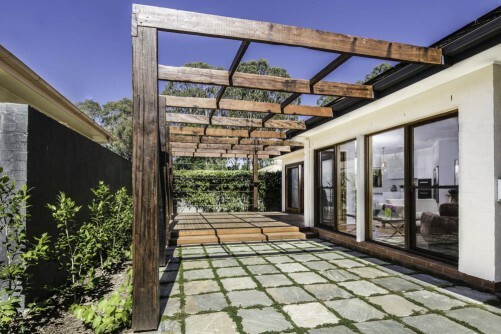 The thorough efforts of our project manager and the rest of the Build Professional team provided the foundation for a smooth and efficient approvals process and build. They were a pleasure to deal with. Once work started on site, our builder was exceptional. His workmanship, communication and site management were outstanding. 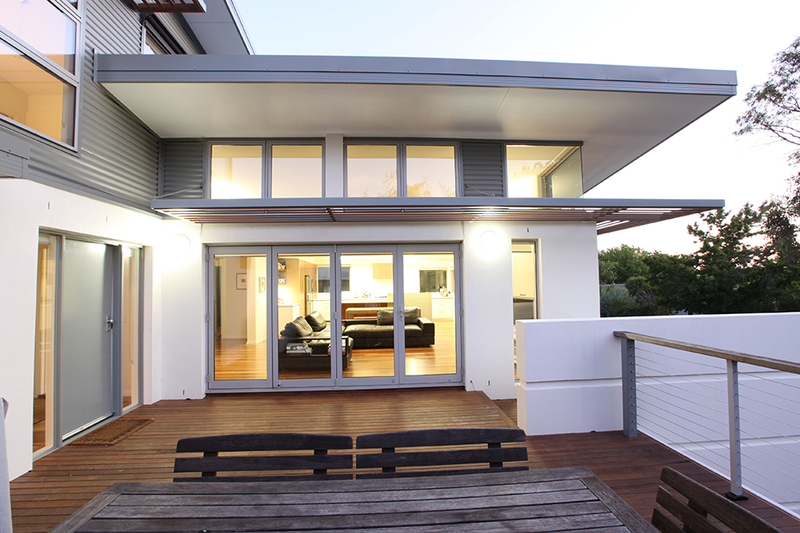 Build Professional also set high standards for the other trades involved. Our home now works fantastically for us as a family and we greatly enjoy living in it. 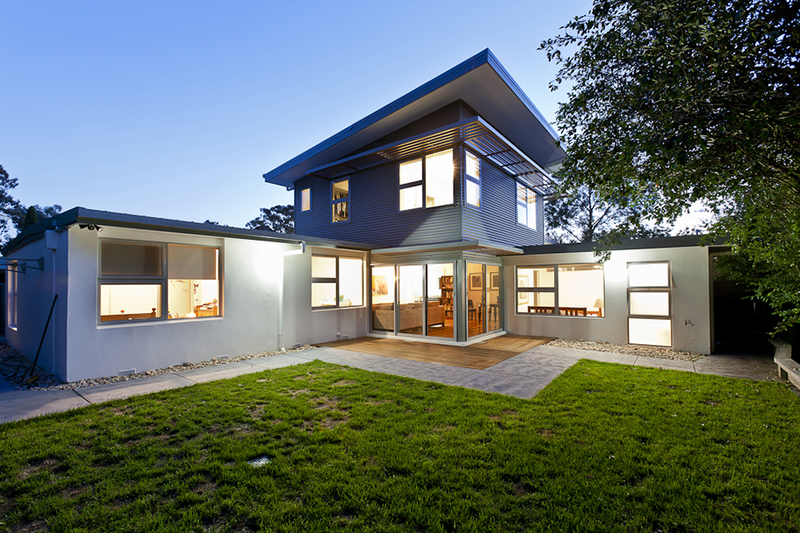 We recommend Build Professional to others looking to renovate or extend. I want to thank you and everyone at Build Professional for the great work you have done in designing and building the extension to our family home. 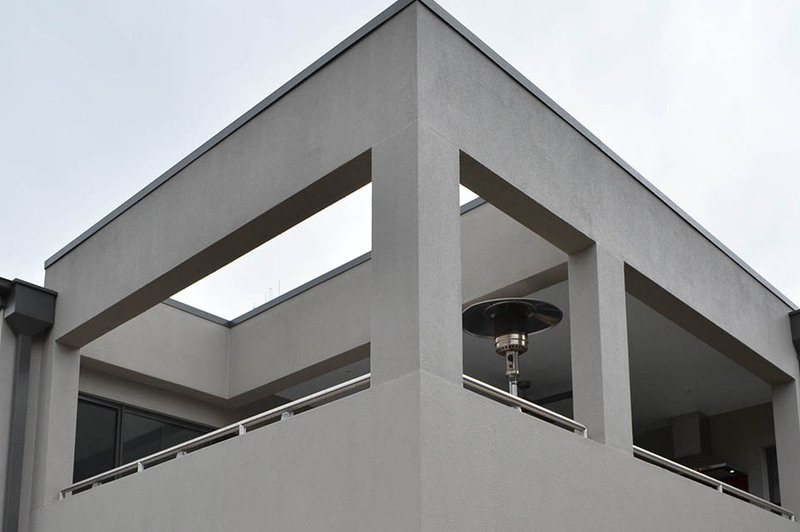 Throughout the process, our job was done with care and an exceptionally high level of customer service resulting in a very positive experience working with you, your team and subcontractors. 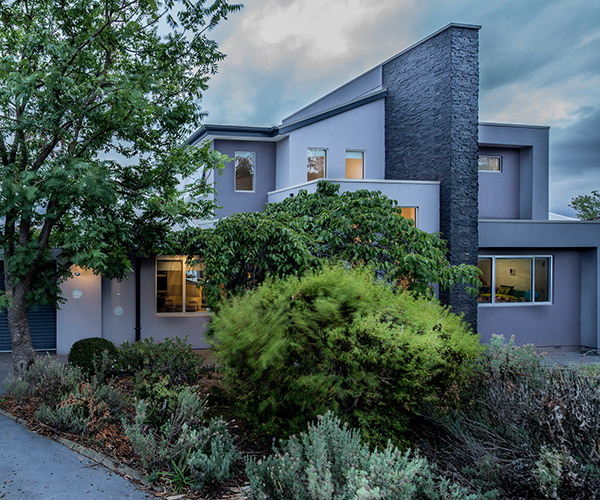 The renovation costing provided at the design phase was very accurate and the full attention to detail in the Build Professional design was only fully understood by us after the building was completed. The design has transformed an outdated house into a family home that we really enjoy living in and are proud to call home. We lived in the house throughout the building process and were pleasantly surprised at the extent that the Project Manager and his team went out of their way to make sure we could maintain our family lifestyle with minimal disruption during the building work. They produced quality work and were always professional, courteous and helpful and left our home and the whole work site extremely clean and tidy and the end of each day. I am happy to recommend Build Professional to anyone who is considering undertaking building work. My husband Nick and I had the good fortune to engage Build Professional for the renovation of our home. I say ‘good fortune’ deliberately because our experience before, during and after our project has been excellent. Compared to some of our friends also undergoing home renovation who have relayed their horror stories with other contractors, we realise now just how fortunate we are to have chosen Build Professional. 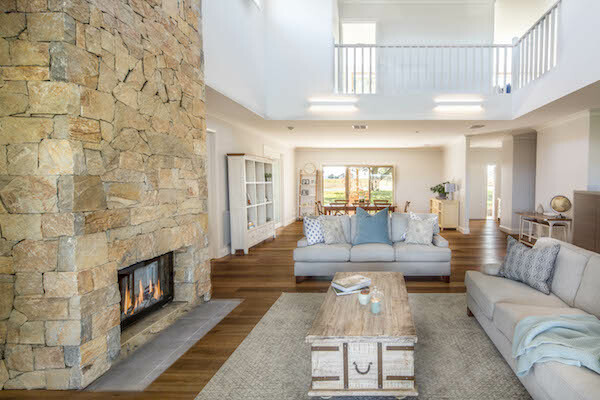 They have a skilled team with the experience and ability to plan and complete building works around a busy family living at home while it is renovated: building an aeroplane mid-flight would be easier! We were careful with our budget and they stuck to it. However, it is the character of the people and our confidence and trust in all the trades that Build Professional engaged in our home that sets Build Professional apart from being just ‘any renovator’. They communicated exceptionally and finished the project with our family and contractor relationships all in good shape. I am proud of the transformation we achieved together. Our home has changed from something which was a little tired and showing its age to a modern, unique family home. We approached Build Professional to extend and remodel our current home to meet the demands of our growing family. 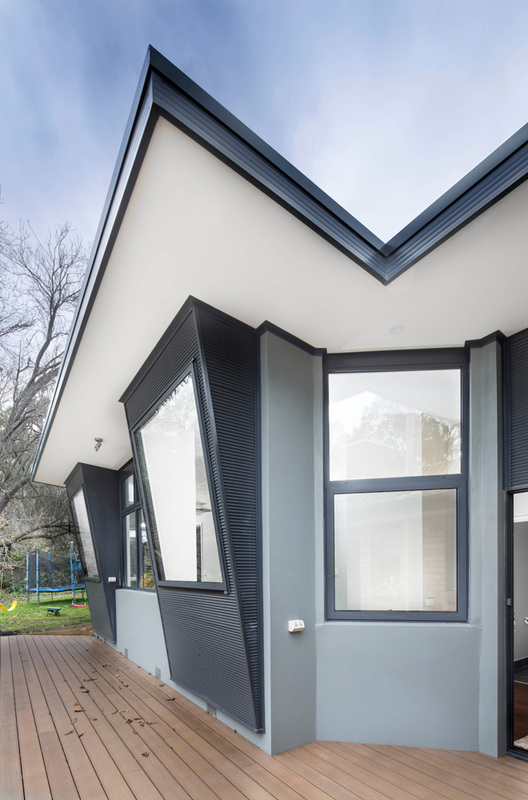 The final design not only resolved issues with the function of the existing home and block but worked with us to accommodate our requirements – including the window seats we really wanted – in creative and beautiful ways. Our home is a joy as a result of those thoughtful designs and conversations. We lived on the site, with our busy young family throughout the build and we were very pleased with the professionalism and attention to detail of the Build Professional project manager in particular and the quality and professionalism of the tradespeople generally. The project manager demonstrated exacting attention to detail and took great care in solving problems and making decisions. 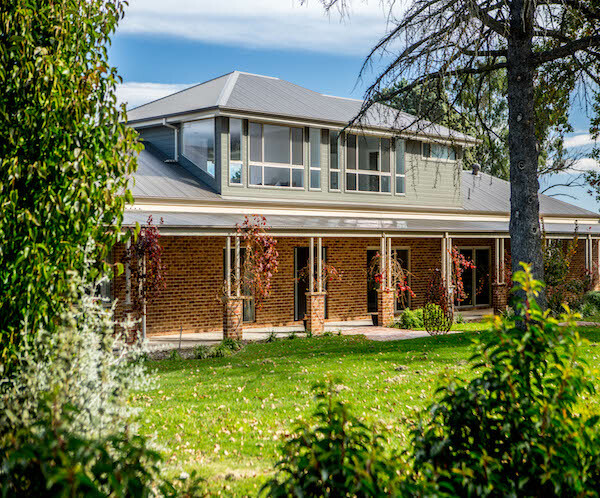 The combination of the creative designs, considered advice and impressive execution of the plans has resulted in a home that continues to delight us. Our journey with the Build Professional team was a relatively long one. Not because of any inefficiencies, lack of service, or scope of works, but simply because both parties were determined to achieve the right solution from the outset. Consequently, we worked closely in devising the right design in both form and function. The Build Professional team were proactive in this process and accommodating to our brief, even when a 180 degree change occurred. No one likes the disruption of a building site, however it was completely manageable thanks to the hands on and obliging Site Manager and great communication. It is also important to note that the high calibre of the “Subbies”. Almost without exception, they took great pride in their work and it was clear they enjoyed a good relationship with the Build Professional team. Needless to say we were delighted with the end result and the company’s determination to keep the customer happy. And happy we are. Thank you to Matt and the Build Professional team for the excellent work you did in remodelling our home. 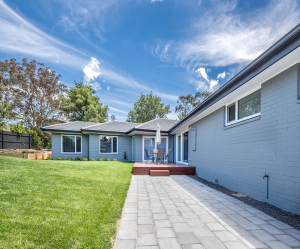 We had a list of specific wants and desires on how we envisaged our home to look and from the initial meeting with Build Professional they understood those needs. Their ideas and ability to get around potential problems was excellent and the finished product speaks for itself. Thank you also to your sub-contractors who provided the highest quality of workmanship in the various trades, but in particular we would like to thank Mystic Timber Floors who did an outstanding job laying new timber boards and for the care they took during the varnishing process – merging the old with the new was never going to be easy but the finished product is excellent. 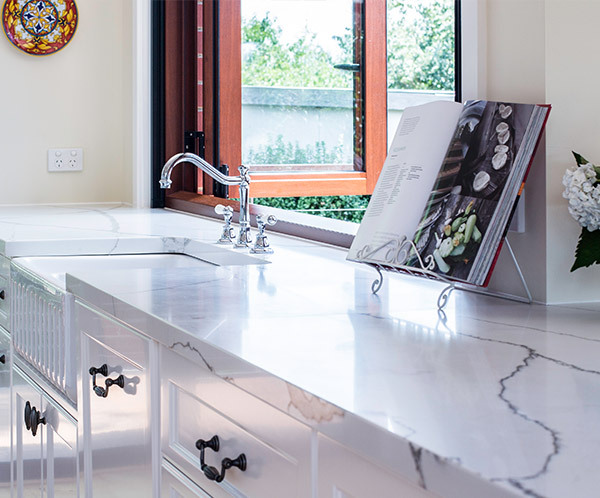 To P & K Joinery, words cannot express how happy we are with our new kitchen and for understanding our wish to think outside the square, building a truly beautiful kitchen which is timeless in design. 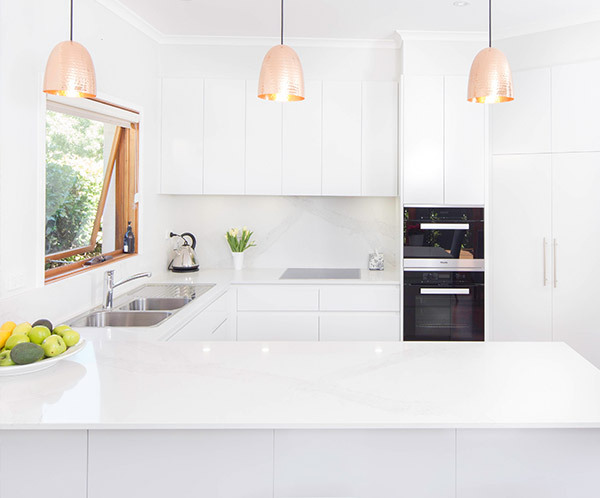 Nothing was too much trouble for them, and they worked with our ideas while providing their expert advice on design and in particular offering advice on the finer details which sets this kitchen apart from the rest. Their craftsmanship and attention to detail is second to none. 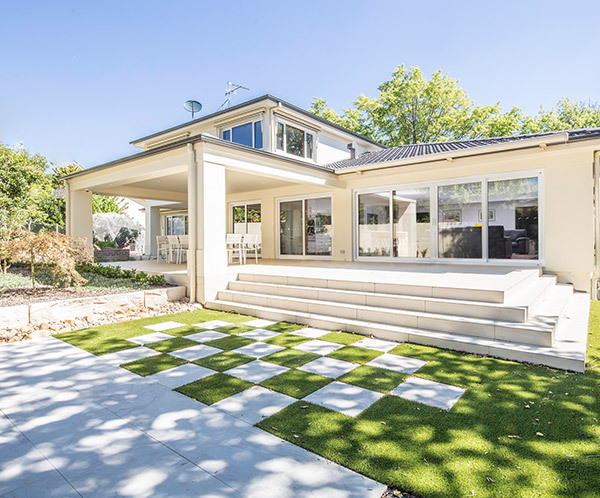 The project management on our renovation was efficient and timely, and we have no hesitation in recommending Build Professional to potential clients who require a high quality outcome when building or renovating their home. When we decided to extend and renovate our home, we were bracing ourselves for a year of stress, headaches and problems. Having used our own architect to draw up the plans, our own certifier to obtain the building approvals and conduct all stages of inspection, and our own supplier for plumbing fittings, we were expecting finger-pointing and blame shifting when the bricks hit the mortar. However, we were pleasantly surprised at how seamless and organised Build Professional made the process. Some of the highlights were a detailed project plan before work started that allowed us to track the progress week by week, Provisional Sum tracking throughout the project, and the flexibility of allowing us to move in on the previously agreed date while working around us to finish up. The neighbours have commented on how clean and quiet the work site was during the construction, and it was good to see all workmen treat our house as a home and not just as a worksite even when it was just four walls with no roof! The office staff and the on-site project manager was always courteous in dealings with the tradesmen, certifiers, inspectors and all other stakeholders through the process. Thanks to the Build Professional team for a truly professional job! I would like to tell you how very grateful we are for our lovely new house. The whole process for me, was a positive one. We really do love what has been achieved. Some of the team who need special mention, apart from you and the gorgeous and patient Design Consultant Anna, is the Construction team. I have appreciated their attitude to their work but also to their clients! The attention to detail with the deck was a joy to witness. I cannot thank you and Sally enough for the very positive feedback on our little house. She brought some beautiful flowers in yesterday, for which I was very grateful and quite touched. Nathan, the professional photographer, too is a lovely guy. I was a little apprehensive about having photos taken but he was great. Many thanks. And Ewan, the landscaper… He’s quite a special man. Thank you so much for putting us in touch with him and his team. I think the calibre of all of the tradies is a reflection of the culture of your business, so you can be justifiably proud of your high reputation. And lastly, thank you for our complimentary meal and the night at Ox Eatery – that was so very much appreciated. I shall miss the skip out the front……. Here it is – a renovation from the owner’s point of view. It certainly was an action packed adventure, and fun to record in pictures. Was it worth all the chaos and disruption? Definitely. We have a new home but it retains the original familiar character we fit into so comfortably. New views, air, light, sunshine, easy access outside, spaces that work – our everyday living has been improved immeasurably. Thank you – all of you – for making it happen. A thank you note written on the inside cover of a beautiful photo book titled “A Renovation Project by Build Professional” designed and presented to Build Professional as a memento of our journey together with our lovely clients, Tony & Patty. “The build went as smoothly as it could when, typically, the drought broke just as the roof came off. 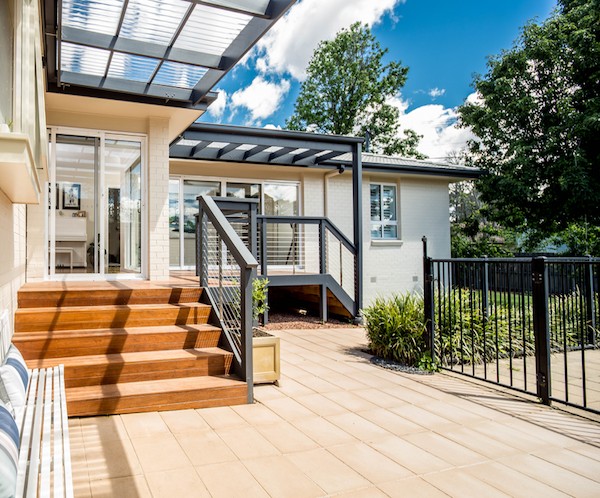 The builder worked extensively behind the scenes to develop solutions to any problems that arose during the build, and provided clear and practical advice to us, a pair of novice renovators, to help us achieve the outcomes we wanted in as cost effective manner as possible. 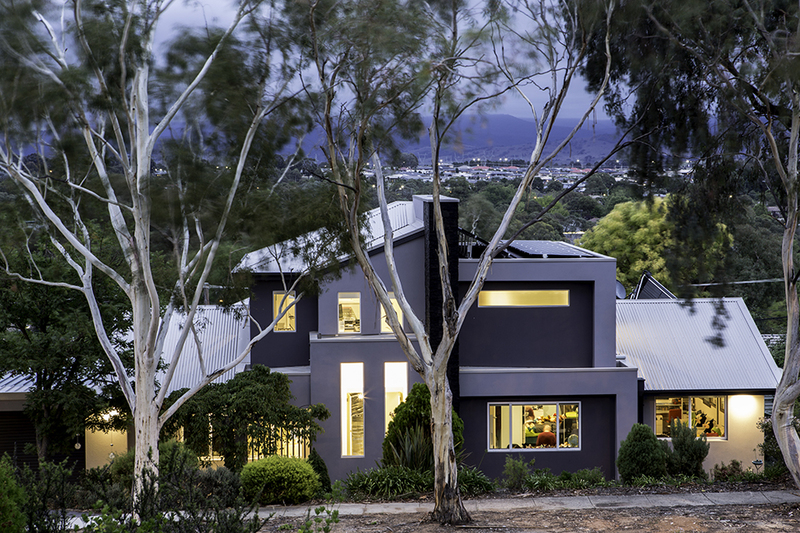 “This well designed remodelling and extension provided the client with a large beautiful home that maximised the amazing mountain views and offered them a modern energy efficient home, with greater living space with separate living and working zones. The very high standard of the tiling is just one aspect of the project that shows the quality of the trades involved. 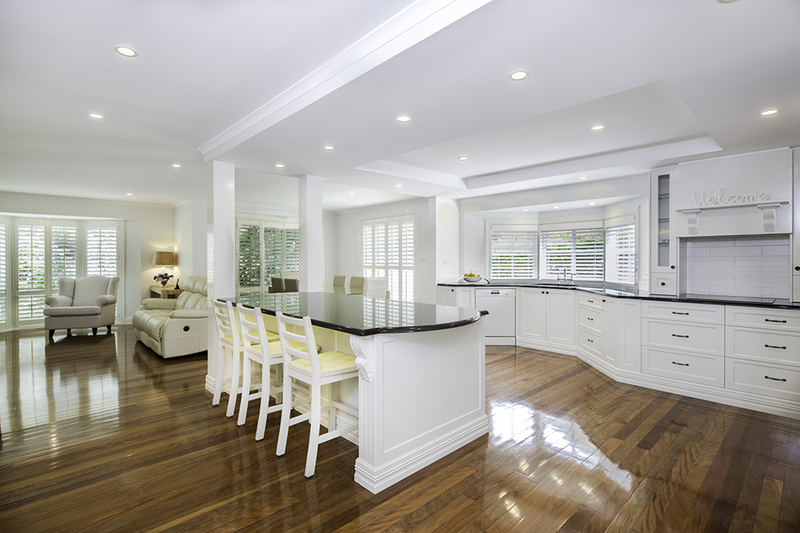 This extends throughout the home in the kitchen, bathrooms and living areas. 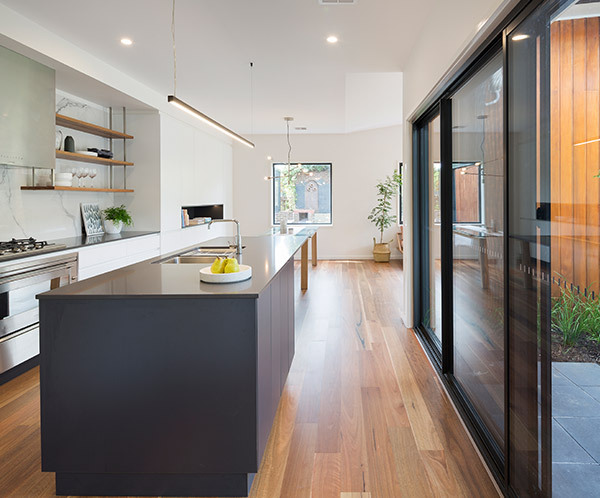 “The Build Professional team designed a concept that met the client’s brief, budget and requirements of gaining additional living space, access to the cellar in the garage below and improved flow throughout the home. 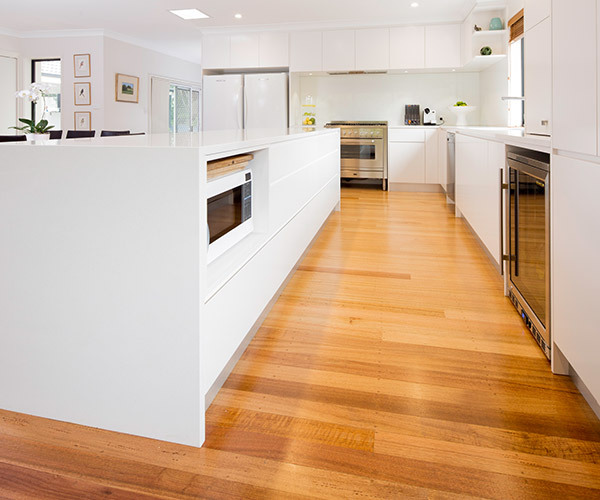 The design included removing all the load bearing internal walls of the lounge, kitchen and laundry to create a large open and light filled space. 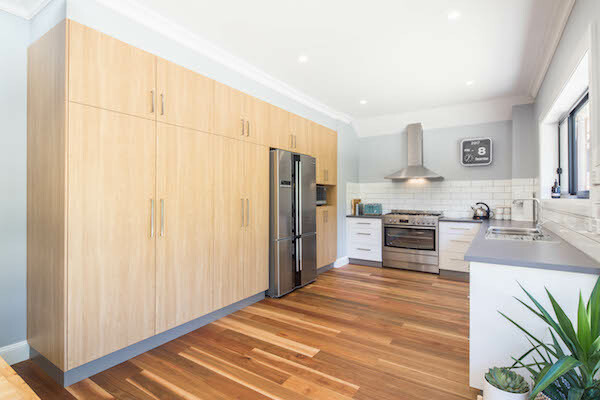 The kitchen was designed to work harmoniously with the new flow whilst separating the two main living areas and functioning beautifully as the hub of the home. One nice surprise hidden within the tongue and grooved hardwood flooring is a trap door to the cellar below. Special consideration was taken to ensure none of the trades disrupted the client’s prized garden. 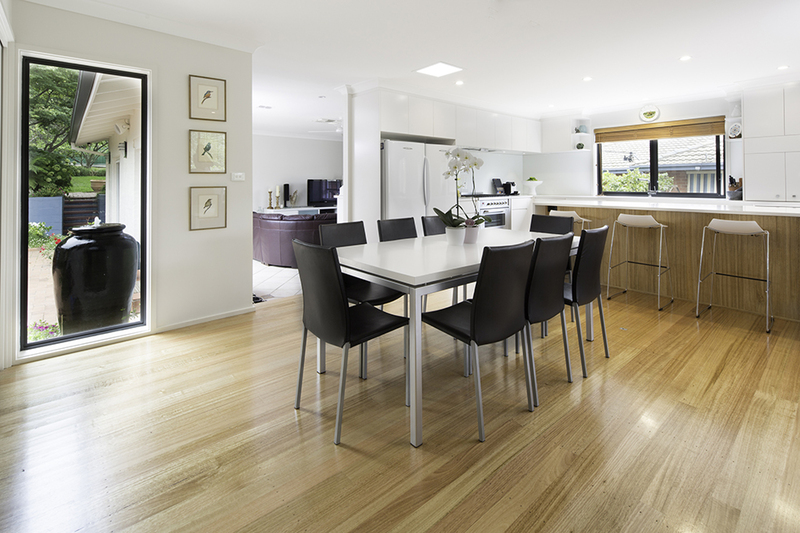 “Build Professional’s highly skilled team delivered a creative design to meet client requirements for open plan living. 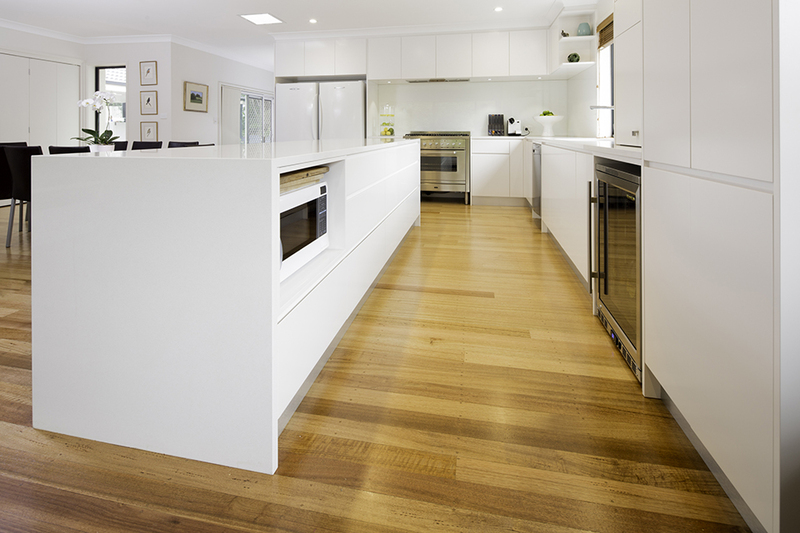 The excellent finish and workmanship achieved in this project highlights their dedication. 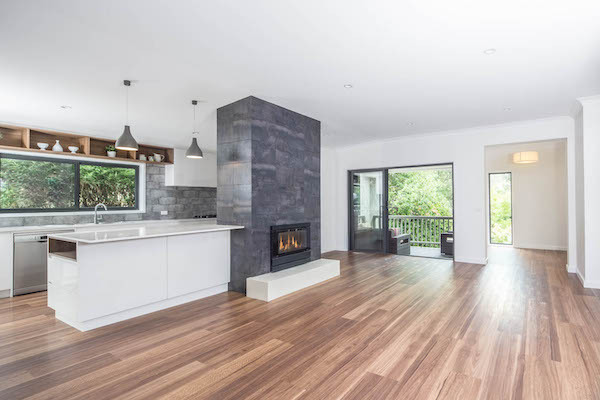 The high quality matching timber floor and quality tiling, fixtures and fittings made this project stand-out in a very competitive category. “An inspection of this project would suggest that no remodelling work had taken place. The new rooms were so successfully integrated they appeared as though they were always a part of this home. 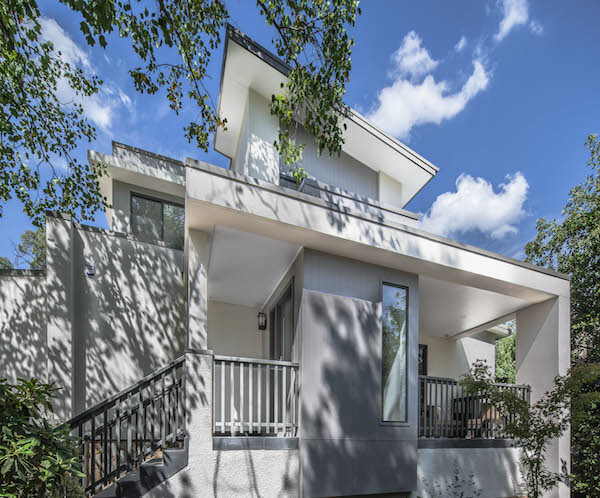 “This was a relative complex and intricate build project that has been carried out efficiently by a builder who was very involved and demonstrated great attention to detail. The ‘floating roof’ involved some structural gymnastics which was organised executed very professionally by the builder. The degree of difficulty was high.